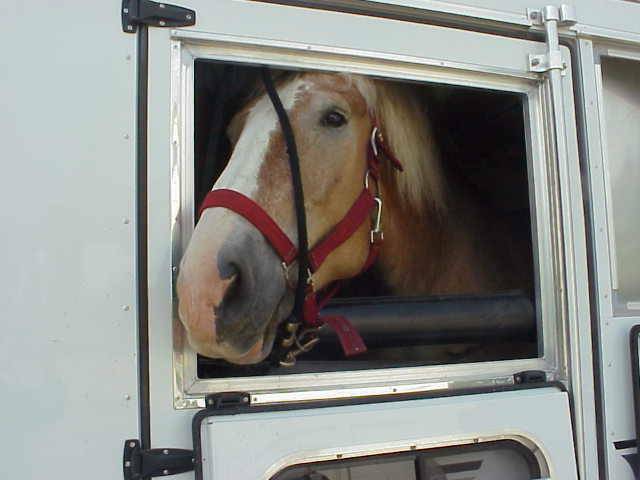 Not everyone who owns a horse, owns a trailer. But if you've come to this site, you're either looking for a trailer, looking to upgrade your trailer, or wishing you could do either one. 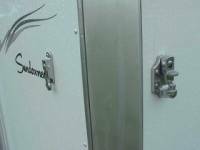 Choosing a trailer doesn't have to be a technical task. Many things to look for make common sense - and some of them may surprise you - or at least entertain you. 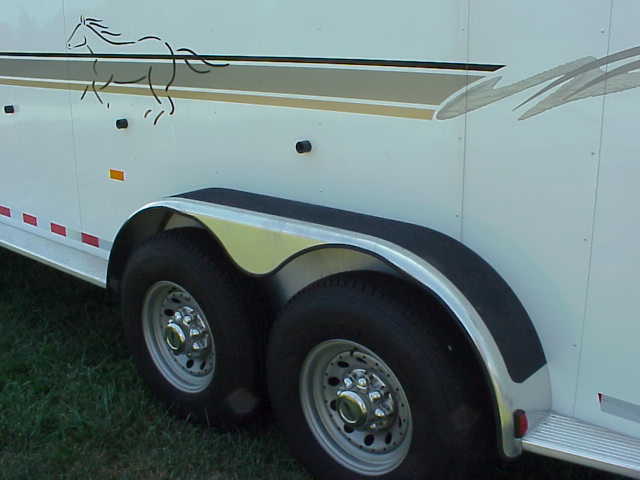 So what do you look for when you buy a trailer? I've talked to many folks and the responses may surprise you. While many will dig into specs, construction and weight ratios, many more simply look for a trailer with a good reputation, easy to use and attractive to pull. 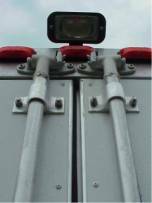 Safety is always a consideration but price often drives the final decision. Translation: They want the most for their money. What brands are the most popular? Depends on the part of the country you live in. But there are a handful of well recognized brands that seem to hold their resale value better than most. Sundowner is definitely in that category. First let's get the proper perspective of you - the buyer - because this will greatly impact what is important to you. For example. If you're Jeff Gordan racing NASCAR, your requirements will be quite different than my own. I have a young family, we rodeo occasionally but mostly do the local shows. We get there, and we get home. Pure transportation. 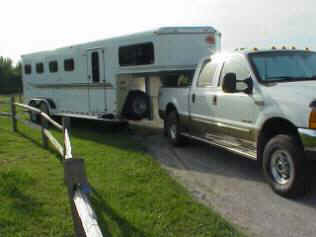 I want a trailer that won't break the bank, is easy to operate, pulls easily, and will hold it's value. 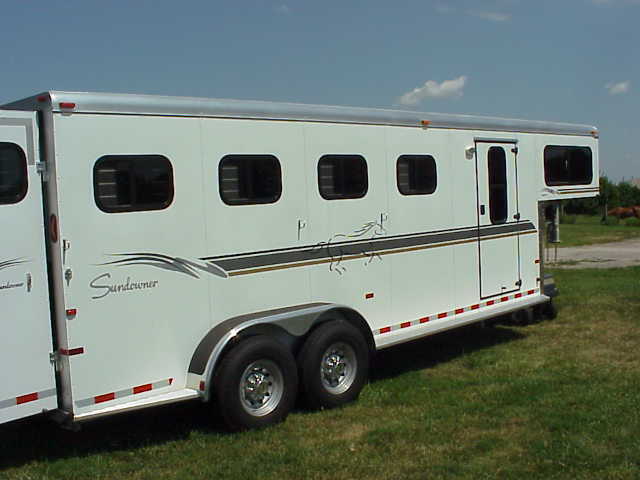 Sundowner chose a 4-horse Valuelite slant load for us. Here's what we found. In a word. Easy. Our trip from Oklahoma City back to Kansas City was over 300 miles and I had to check my mirror to make sure it was still back there. To be fair, pulling is relative to the power plant you're using. ( I was driving a 2000 Ford Powerstroke diesel crewcab with a shortbed. (4x4) But I've pulled a lot of trailers. Some have not tracked well at higher speeds, and others pulled as though they had a 40 foot silk drag chute attached to the rear. 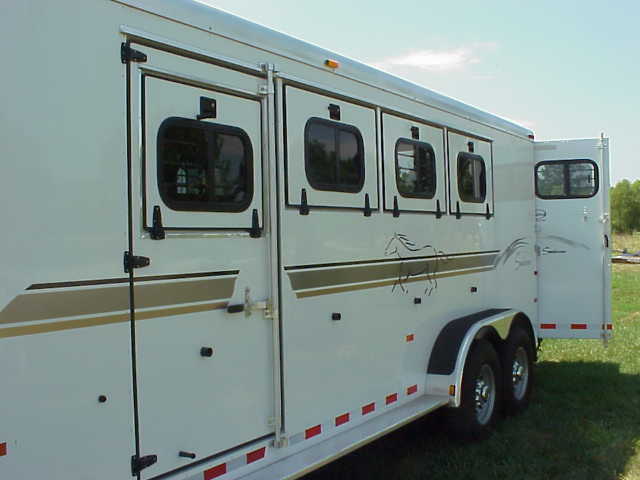 While clearance is a good thing - it also forces a horse to step higher when entering a trailer. The Valuelite we tried had a clearance of about 17 inches. Higher than some. 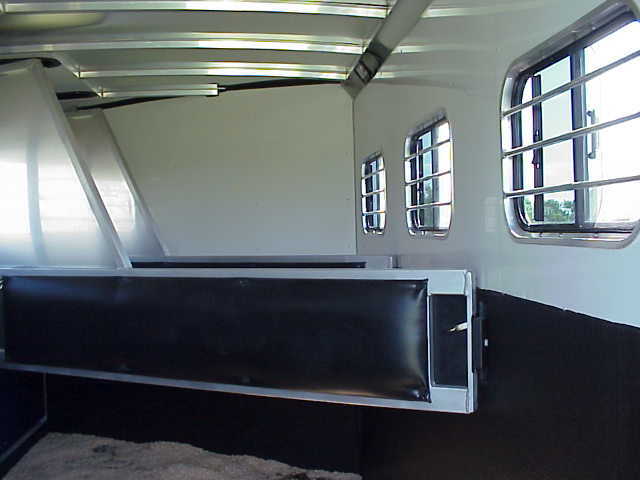 Acceptable to me because I worry about low profile trailers on the uneven fairgrounds we often experience. 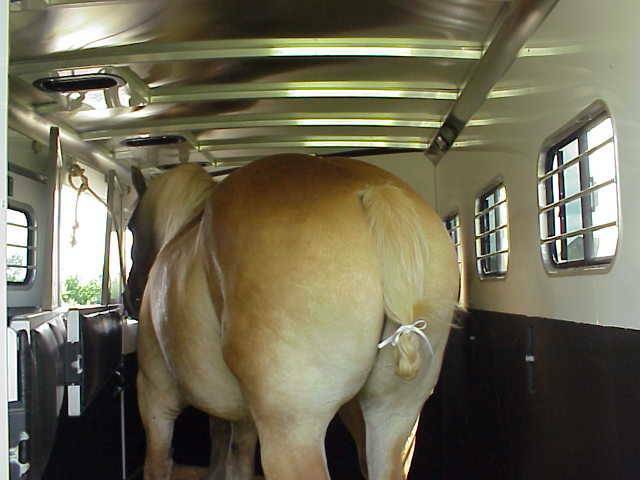 Our horses load well. If you have one that doesn't, I would look into a drop ramp. They are a nifty option. I looked for a way to hold the dividers open. I didn't have to. Dividers on our Sundowner were spring loaded and they swing and hold open on their own. (See picture inset). Great idea. If you've ever had to swing a divider closed quickly on a horse you just loaded and needed both hands to release the snap holding the divider open, you know exactly what I mean. Door latches are pretty standard, though I do prefer the vertical bar pictured here and used on the Valuelite.. The whole door is pressed firmly to the seal. And strength integrity is critical if you ever have a kicking episode. Nothing new here. There has to be some after-market tool to make hooking up goosenecks easier so you don't have to pitch head first into the bed of your truck to latch them. (Belt buckles are hard on the finish but I'm too impatient to crawl back in from the rear.) You can avoid dragging around a block of wood by dropping the jack down (see inset), but the operation of these manual jacks is cumbersome. 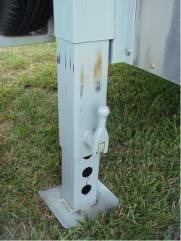 Again, maybe there's some better after-market products available - but hooking and unhooking has to remain one of the most unwelcome aspects of trailering - on any trailer. Sundowner also offers an electric two-speed jack if you're not into increasing the size of your forearms. What can I say? We were very pleased with the overall appearance of the Sundowner. As my wife would say, "It gives me GO fever." You can't deny the reputation of Sundowner and the smooth white finish is easy to wash down. The graphics are simple, but classy. Everyone knows it's a Sundowner and the branding is successful. It's a well-known trailer and easily identifiable. In short - you never have to apologize for showing up in a Sundowner. Personal opinion. But that's what this column is all about. Nice to know at resale time too. I've never had to use the escape door for emergency unloading but just having it gives you piece of mind. Besides, it's nice to be able to have access to that front stall for storage purposes. Sundowner remains a class act for the rest of the industry to follow - whether their competitors wish to admit it or not. Much of their quality remains unseen, in the integrity of their design (like powder coated steel frames and torsion ride axles). They've even tested wind resistance for designing an optimal 30 degree nose and low profile roof. While you may pay a little more for a Sundowner, my experience with the website and the feedback from other Sundowner owners verify you get a return on that investment at resale time. They hold their value. The Valuelite fits into the user profile I described earlier. 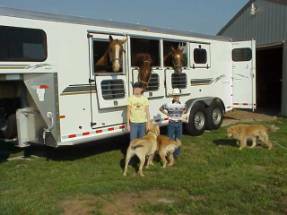 A quality trailer for the discerning horseman with a conservative budget. Retail for the exact trailer we tested is around $22,500. 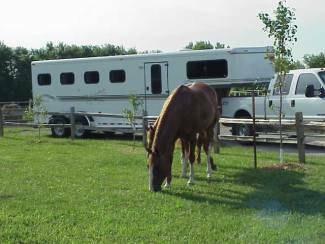 Or email me if you have specific questions dave@horsetrailerworld.com Needless to say, the trailer is in "like new" condition. Sundowner Valuelite is no light-weight when it comes to strength. 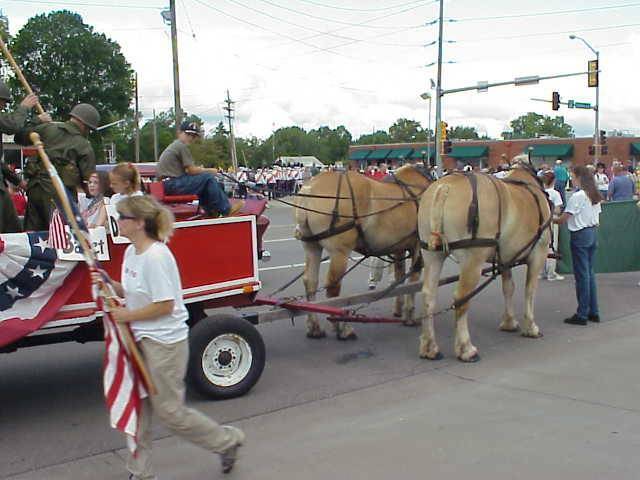 I loaded two oversized Belgian draft horses and hauled them to town this fall for a local parade called "Old Settlers Days". Not a problem. I donated my team and wagon to the kids from Greenleaf Academy. 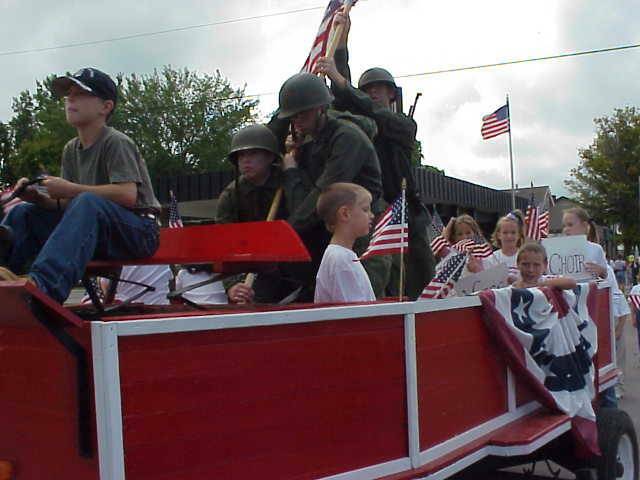 The theme for the parade was "Honor our Veterans" and the kids did an outstanding job recreating the famous flag raising picture from the battle on Iwa Jima during World War II. I couldn't bring the close the stall dividers on them - but Fred found the drop down windows very convenient. 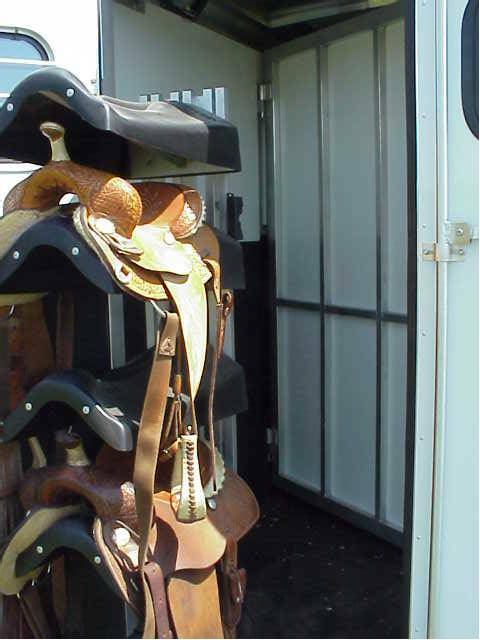 Both sets of harness hung nicely in the rear tack on the swing-out saddle racks. But pictures tell it all. >click here for more pics< Oh by the way. 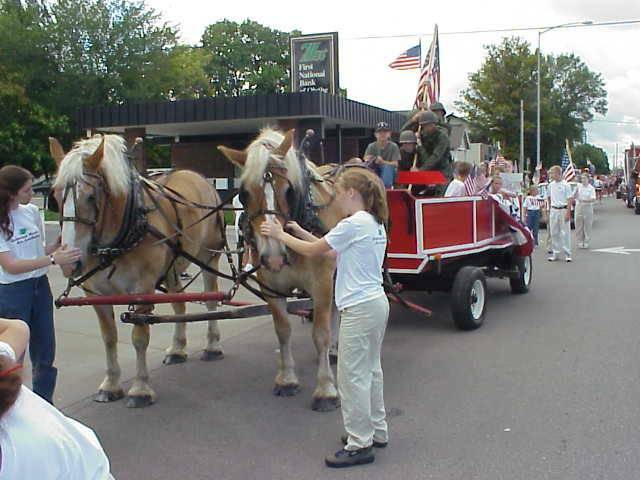 The entry won 1st Place in the horse-drawn category.